Neuropathy is a condition that occurs in conjunction with a variety of other medical conditions. In some cases, neuropathy is idiopathic, which means that the underlying cause of the neuropathy has not been identified. The full name for neuropathy is peripheral neuropathy, in reference to nerve damage in the peripheral nervous system. It is called peripheral because it only affects nerves outside of the central nervous system (the brain and spinal cord). It is sometimes also known as nerve pain or polyneuropathy, which indicates that more than one nerve is affected. Peripheral neuropathy affects three main types of nerves: motor nerves, sensory nerves, and autonomic nerves. An autonomic nerve is involuntary and automatic. The autonomic nerves control the body’s functions, the things that we do without thinking about them, like sweating or heart rate. Motor nerves, on the other hand, control the muscles in our bodies, and we are aware of our ability to regulate them. Sensory nerves relay information from our bodies to our brains about sensation like temperature and pain. Peripheral neuropathy is associated with a variety of underlying medical conditions, including diabetes, metabolic disorders, infection, injury, and trauma. Neuropathy is most commonly associated with diabetes, in which case it is known as diabetic neuropathy. People who have diabetes have too much blood glucose. Over time, this excessive level of glucose in the blood can damage the walls of the blood vessels that feed the nerves, particularly in the legs. As the result of this nerve damage, the ability to feel pain is lessened. Patients may be unaware of physical problems due to this loss of sensation and inability to feel pain. Consequently, people with diabetes are prone to developing foot ulcers and other foot problems. Recent research has indicated that obstructive sleep apnea can aggravate diabetic neuropathy. Changes in the hair, skin, and nails. Because neuropathy causes a loss of sensation and decreased ability to feel pain, patients may be suffering from neuropathy without even realizing it. In many cases, neuropathy is diagnosed when a patient experiences reduced ankle reflexes or painless foot injuries. The lack of feeling in the legs and feet makes people who have neuropathy particularly prone to injuring their feet, ankles, or legs. For this reason, it is particularly imperative that neuropathy sufferers wear proper supportive footwear. Supportive footwear will help to prevent minor injuries like twisted ankles or strains that could become more severe if gone unnoticed due to neuropathy. 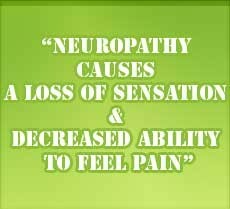 If you have neuropathy, stop in to Foot Solutions UK. We can help you to find supportive footwear that is comfortable and protects your feet. Visit Foot Solutions UK for a free consultation today.